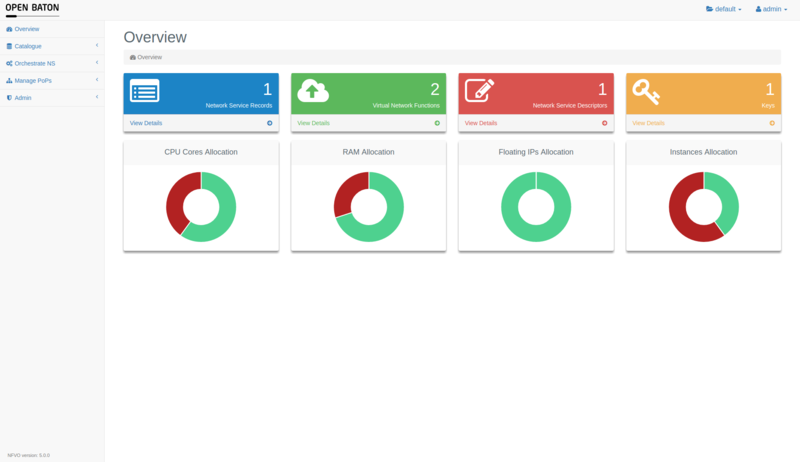 The Dashboard of OpenBaton helps you managing the lifecycle of different objects like Vim Instaces, Network Service Descriptors/Records and Virtual Network Function Descriptors/Records in the OpenBaton environment. The first page that you will see after typing http://url-to-nfvo:8080 or https://url-to-nfvo:8443 (depends whether SSL is enabled or not) into your browser is the following login form. 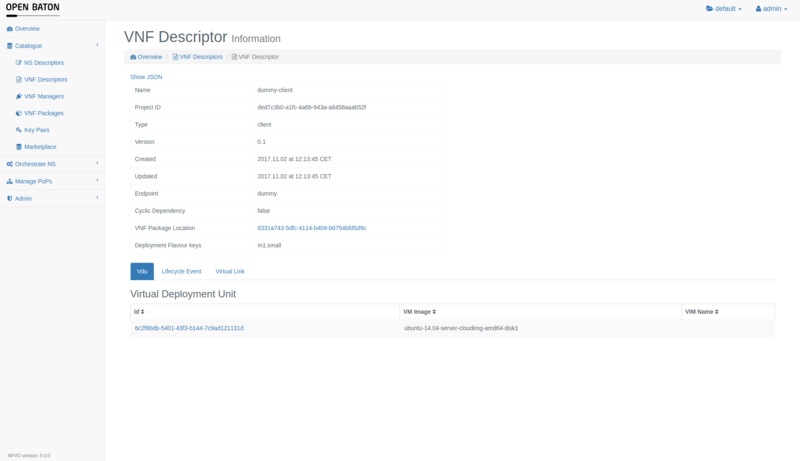 The default user is called admin and has the password openbaton. 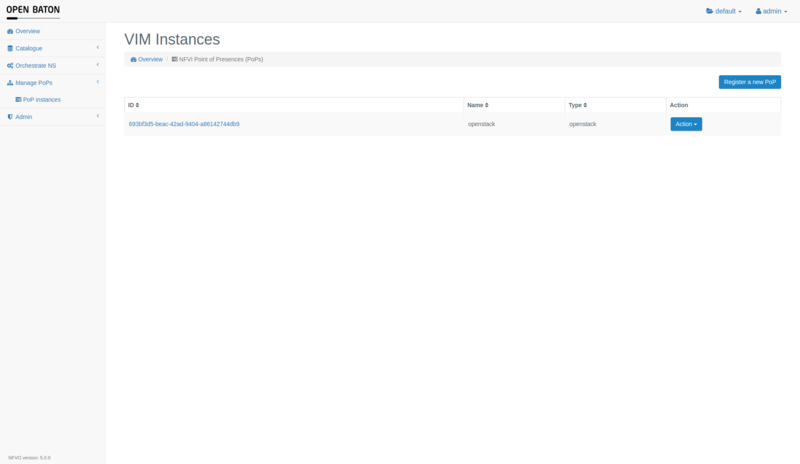 It also shows the summary of the available resources, like floating ips, instances, RAM and CPU cores. 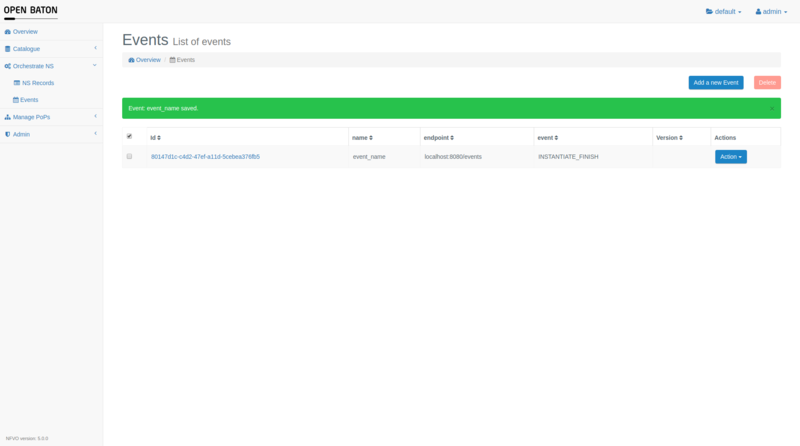 The data is collected from the available PoPs if possible and then the summary is displayed. Test POPs do not grant any resources. The quota information is backed up in cache to avoid unnecessary traffic. You can refresh the data by going into the drop down menu (upper right corner) and choosing refresh quota option. 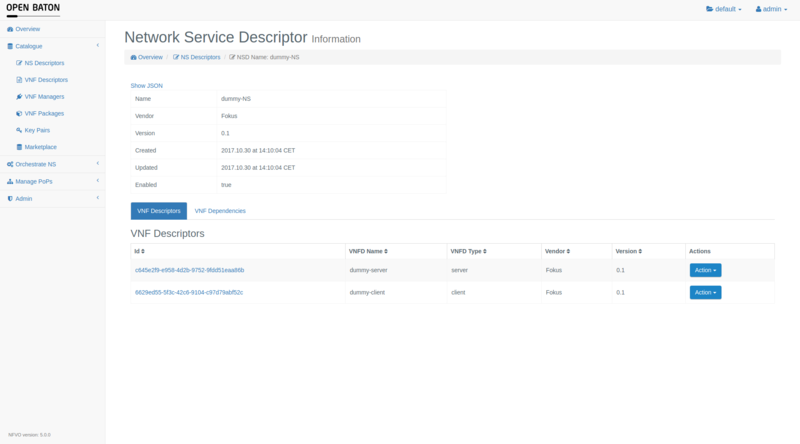 You can now also see the NFVO version on the header panel. 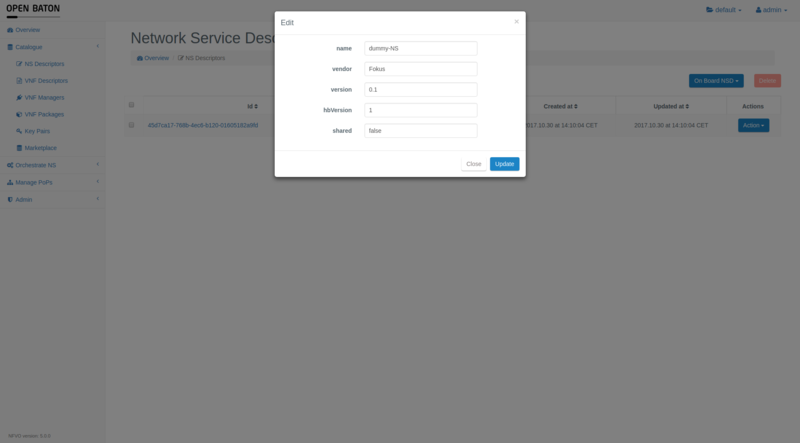 The NFVO uses projects and users with assigned roles so that multiple selected users can work in the same project environment. 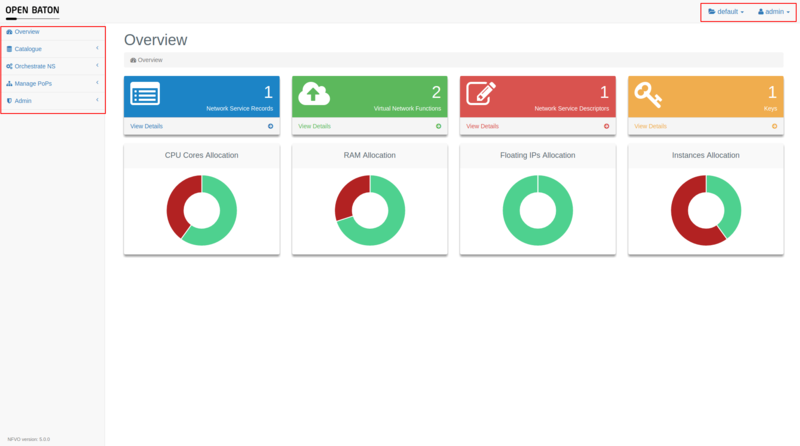 The parts of the GUI to manage users and projects are marked red in the following screenshot. In the upper right corner you can see the current project in which you are working next to the folder label. Click on it to switch to other projects you have access to. Next to this you can see your user name. 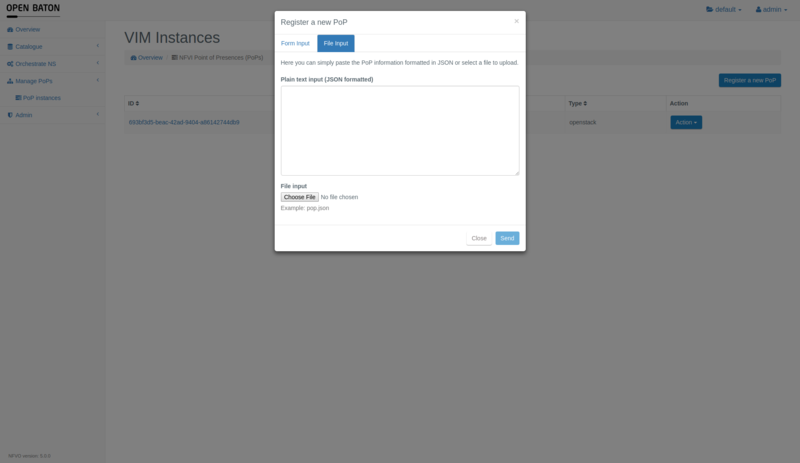 Click on it to extend a menu with the logout button. 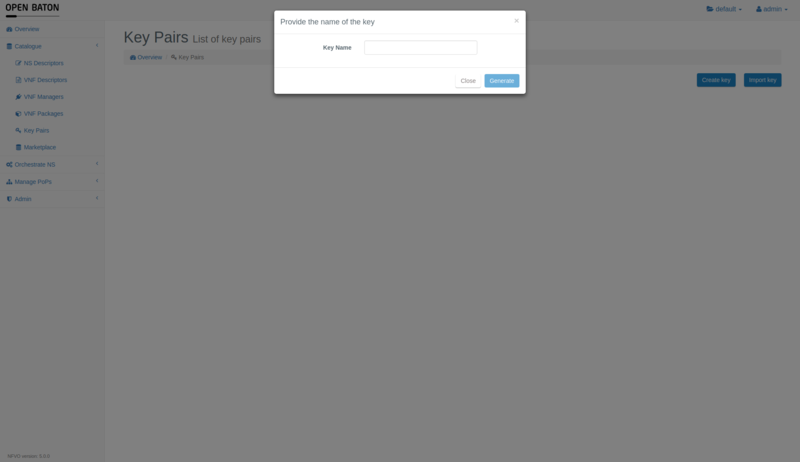 You can also change the password by choosing the command in this menu or use the Help button to open the documentation. 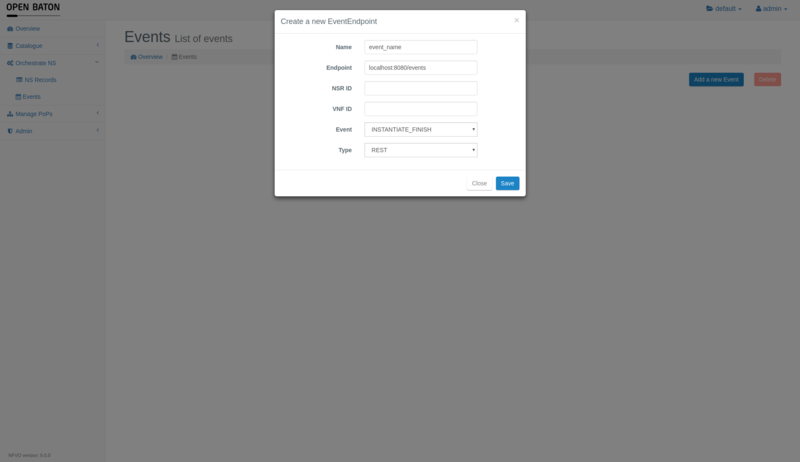 If you select Identity tab, you can add and change projects and users. 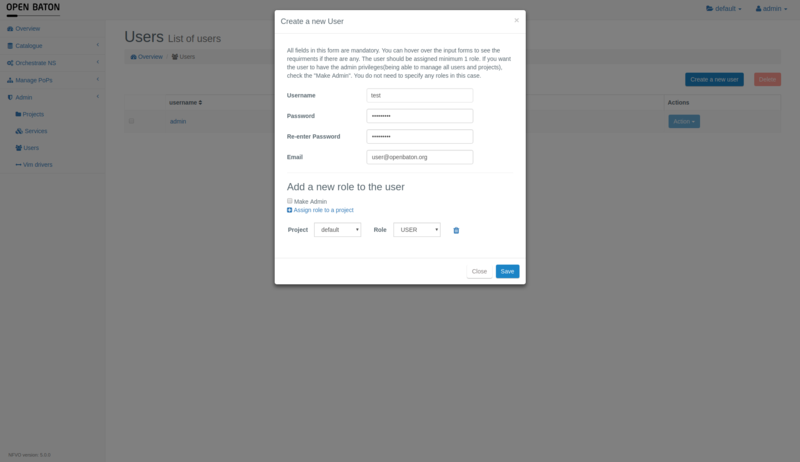 Identity tab is available only to the users with admin privileges. 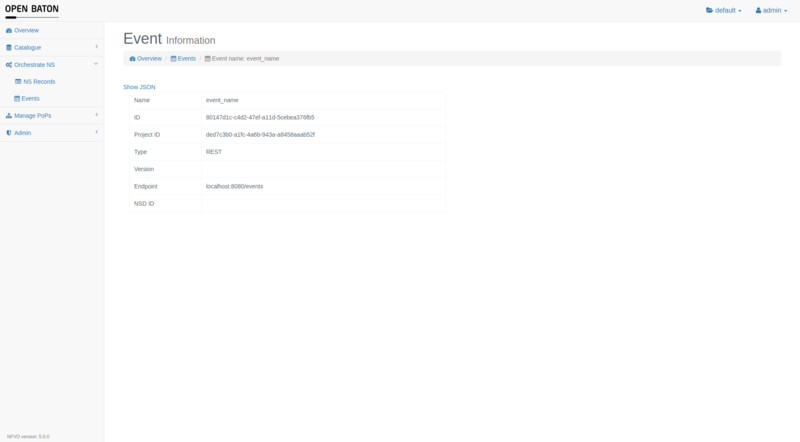 The following screenshot shows the creation of a new user named new user who is assigned to the project default as a USER. This means that he can modify the resources in this project. The role GUEST would basically grant the read-only privilege to the user. If you would like the user to have access to all the projects and resources of the NFVO, you can put a mark to on the Make Admin marker, if the marker is turned on the individual roles you choose will not matter any more and the user will be saved as an ADMIN. The NFVO also supports SSL. If SSL is enabled you have to use https://url-to-nfvo:8443 to access the GUI. If you are admin you call also use vim-drivers menu to download the drivers from marketplace and install and start them. You also have an access to the information about the drivers that are already installed. 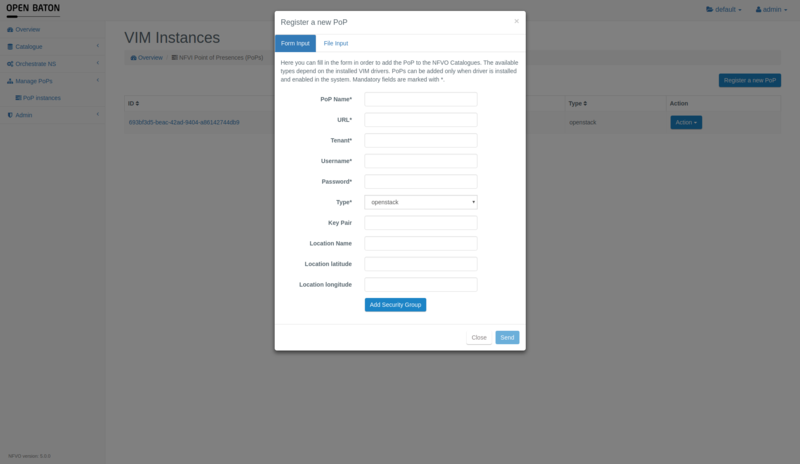 For registering a new Point-of-Presence you can click on the button in the top-right corner Register a new PoP of this page. In the new window you have two ways to register a new PoP. First is to fill out the form with all the data needed to register the PoP. You can choose the type of PoP from the drivers that you currently have installed (test, openstack, etc). You can copy json with the data or provide a file. 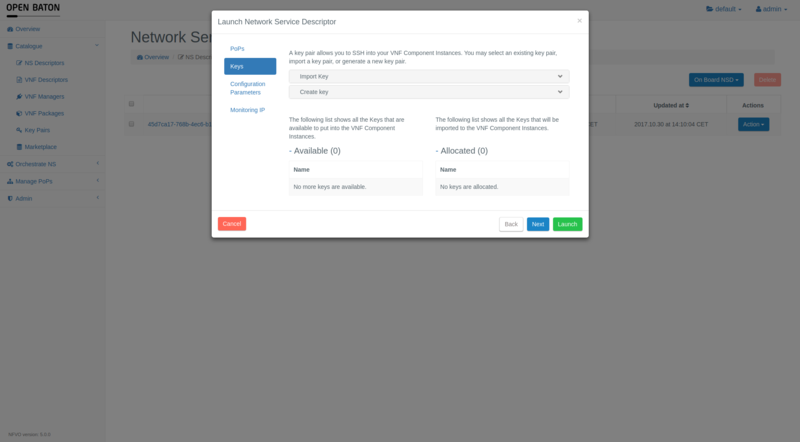 With the opening of the Openbaton Marketplace, it became possbile to download VNFPackages and NSDs directly into the NFVO, for this, go to Marketplace tab and browse the available packages. You can click download button to download and onboard it. If you download NSD, the packages will be downloaded and onboarded automatically. You can find more about marketplace out at the pages dedicated to it. 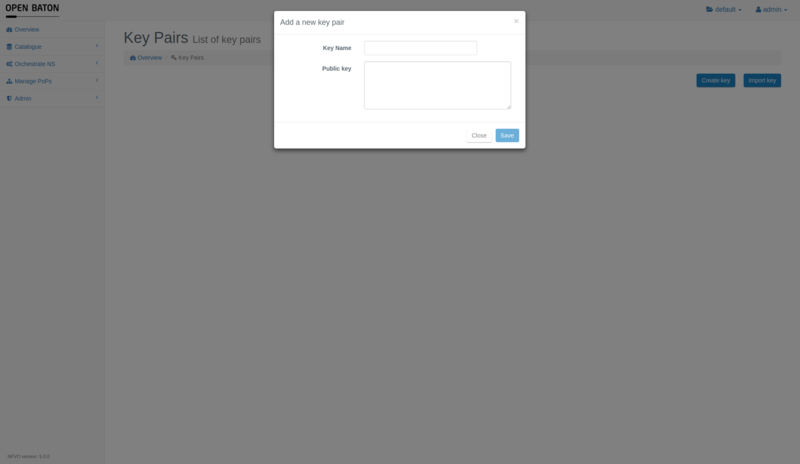 You can add a key pairs to use for ssh access to the VMs via Key Pairs menu. You have two options in terms of adding the keys. You can promt NFVO to create a key for you with a given name: IMPORTANT: You will be promted to download the private key after you press Generate. Currently there is no option to regenerate a key. If you do not download the key, you will have to generate a new one. You can now also pick PoP for VNFDs that you have in your NSD. 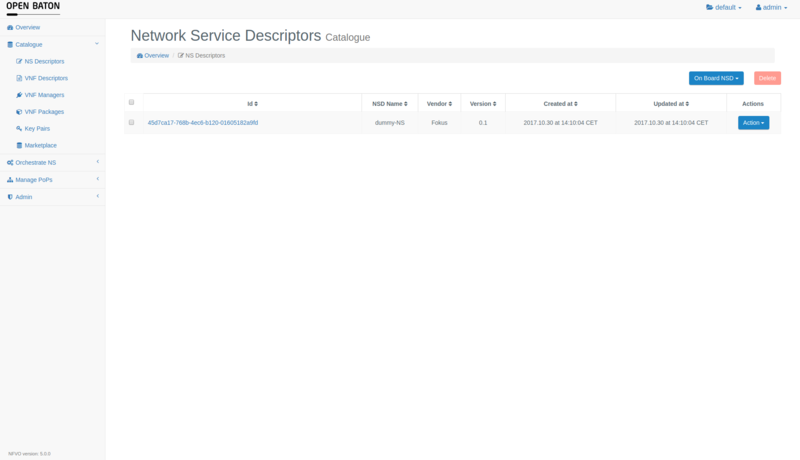 If you click on the id of a NSD shown in the list of NSDs you can see the information stored in this Network Service Descriptor. 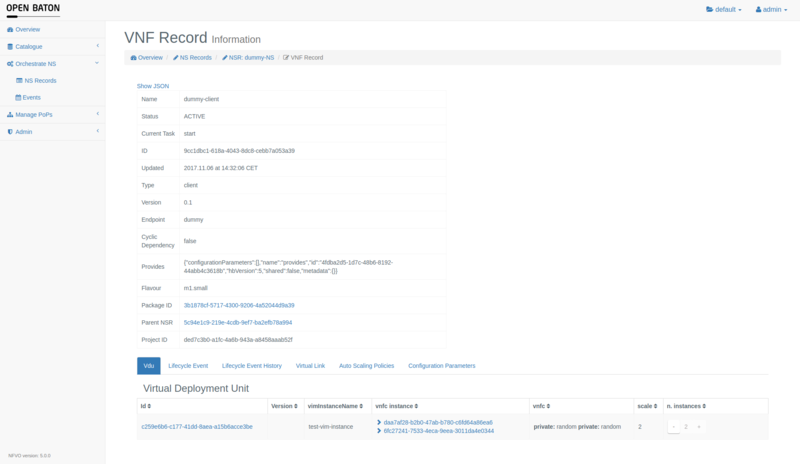 At the bottom of the page you can see the Virtual Deployment Unit (VDU) tab and if you click on the id of the VDU you can see the details of it. 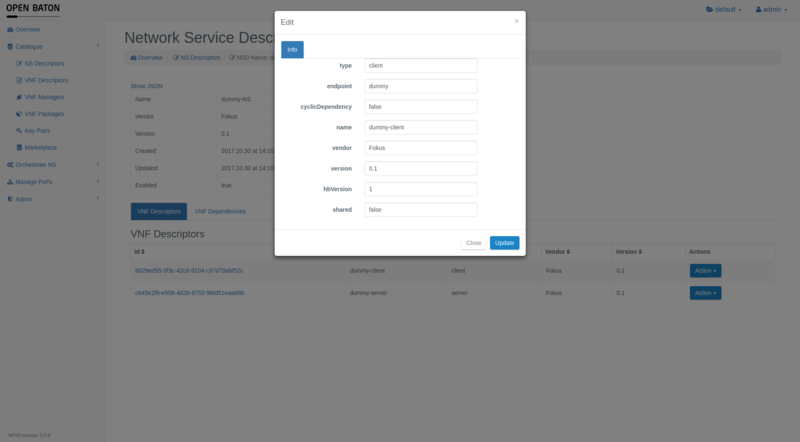 Here you can also start stop VNFC Instances with button. 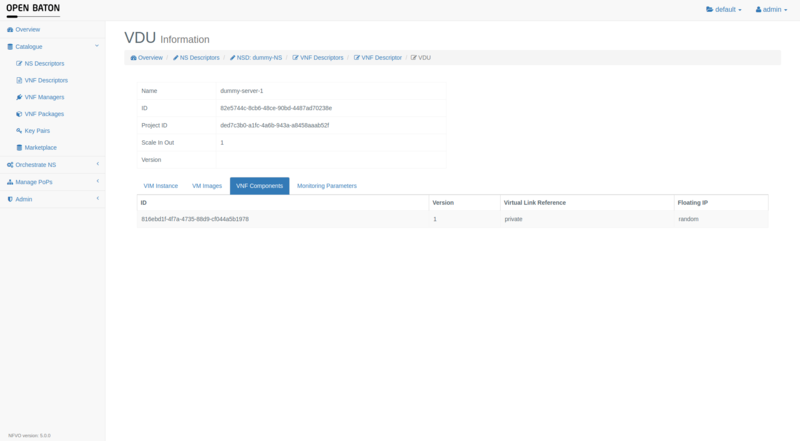 On this page you can upload the VNF Package. For more information about the VNF Package please read the VNF Package documentation For uploading a .tar you can click on the button Upload VNFPackage and this window will be shown where you can drag & drop the file or just click on the white area and choose your file using your file manager. You can also upload csar package instead of usual tar one, for this, just click on "Use CSAR parser" before sending the packages. 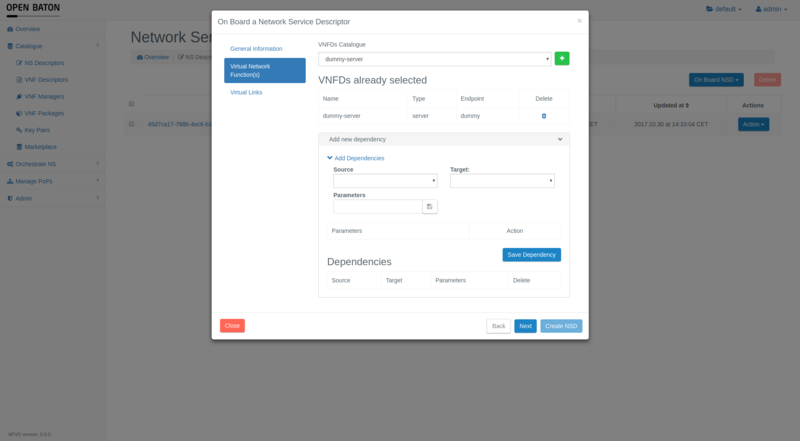 You can also click button Action and pick function Add VNF. 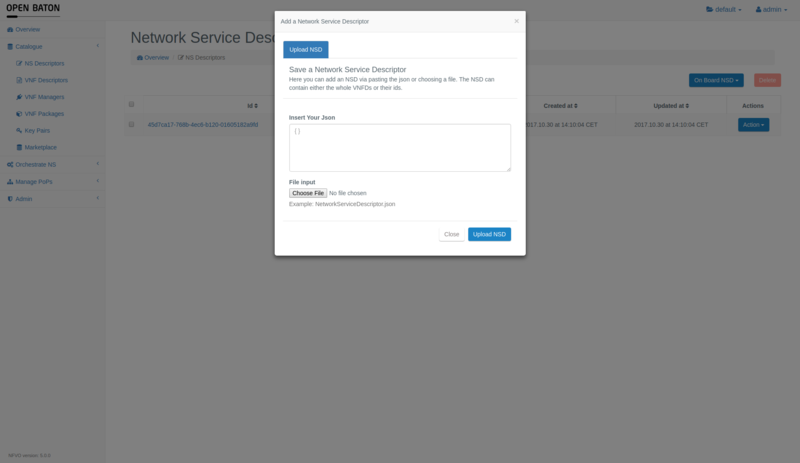 This way you can add a new VNF to already deployed NSR via launching one of the available VNFDs. 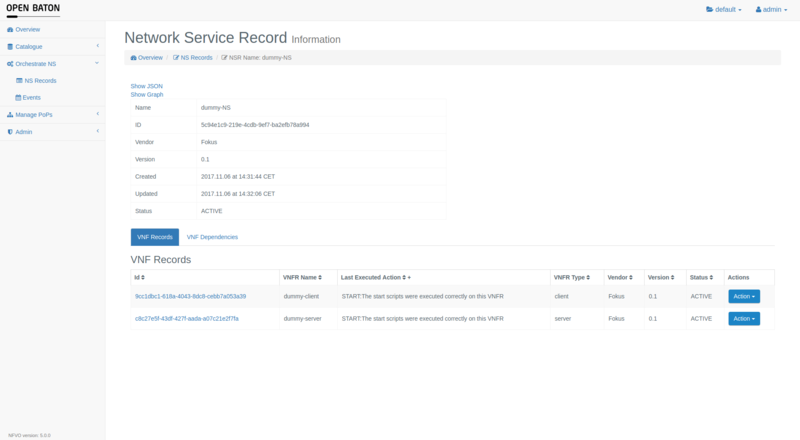 The created VNFR will be added to the corresponding NSR. 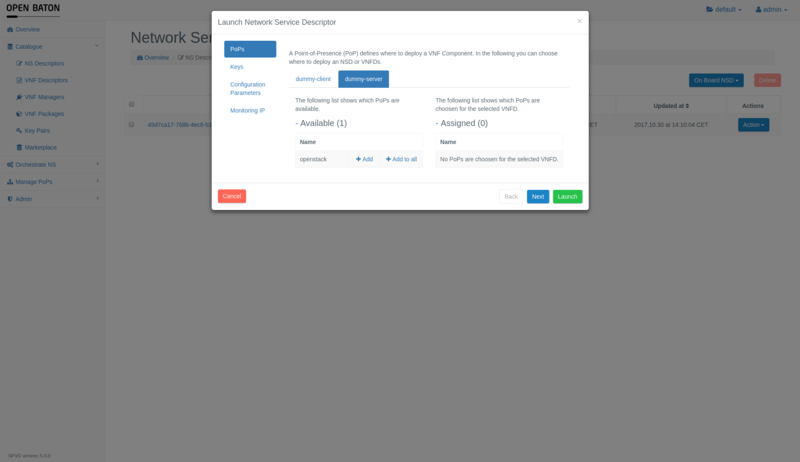 You can adjust the same launch parameters as when launching an NSD for the VNFD after you have picked the one to add. 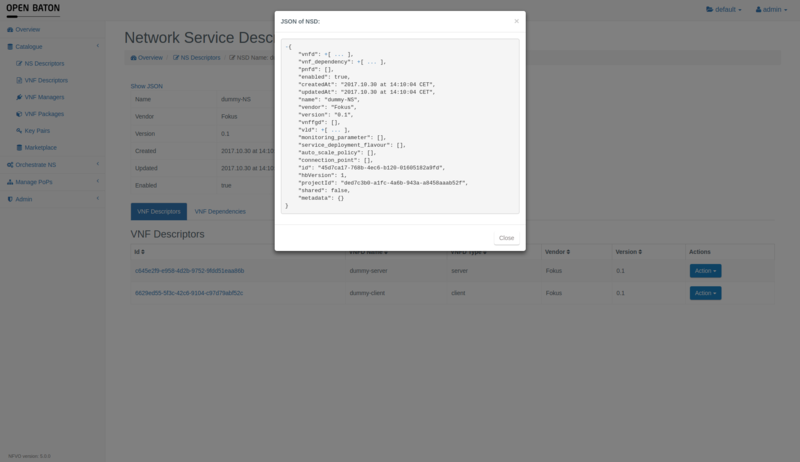 On this page you can look at the JSON file of the NSR by clicking on the link Show JSON and also the Graphical view. 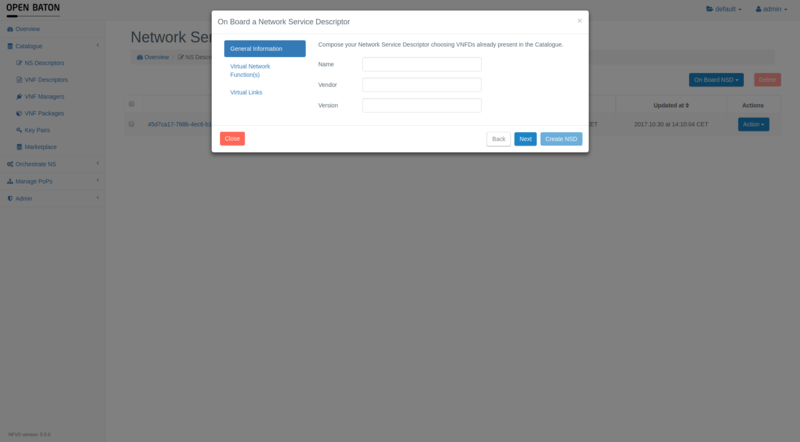 of Network Service Record by clicking on the link Show Graph. 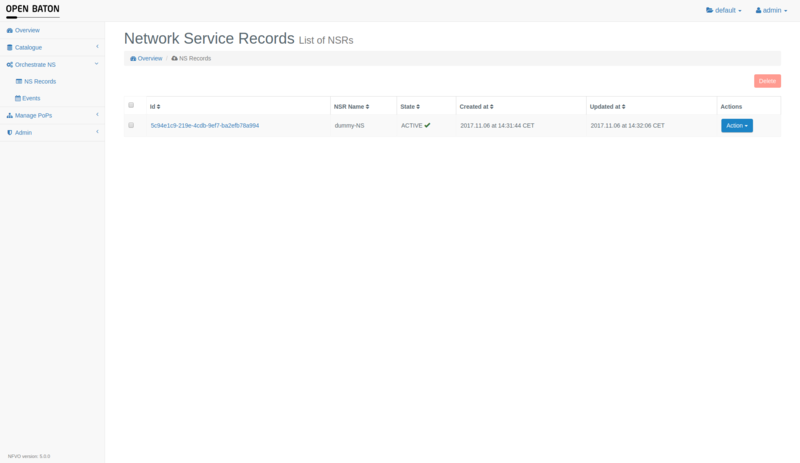 In the table of VNF Records you can delete a VNFR by clicking on Action and then Delete. 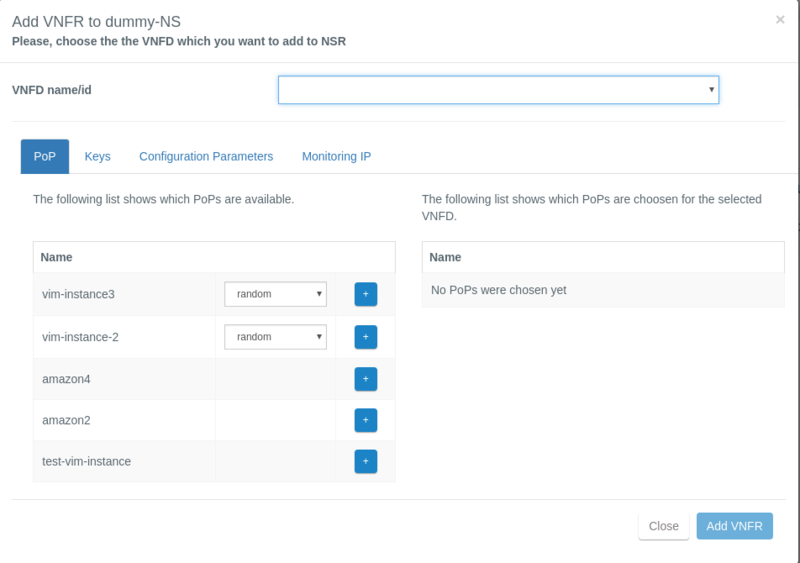 If you have an newer version of the VNFD you can upgrade the VNF to it via picking Upgrade option in the menu. You will be prompted to choose a version to which you want to upgrade. If you want to restart VNFR, you can press Restart, you will be prompted to choose an image with which to deploy the VNFR. Update button will send a request to initiate an "Update" lifecycle event. For the event to take place it needs to be present in the VNFD from which the VNFR was created. 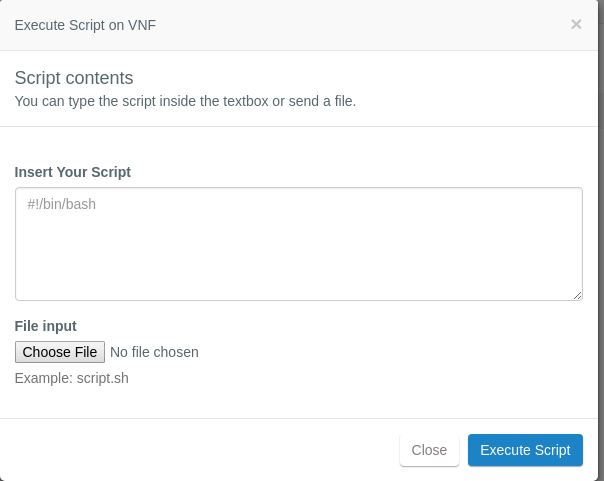 Execute Script allows to send a bash script to the NFVO in order for it to initiate its execution inside the VNF. You can either type in the script manually or choose a file. To look at the details of a VNFR just click on the id of it.